Accessorise with a luxury edge with this bracelet, crafted with two rows of interlinks in precious 9ct Yellow Gold, adding an opulent volume and giving a style statement that is perfect for evening or occasion wear. 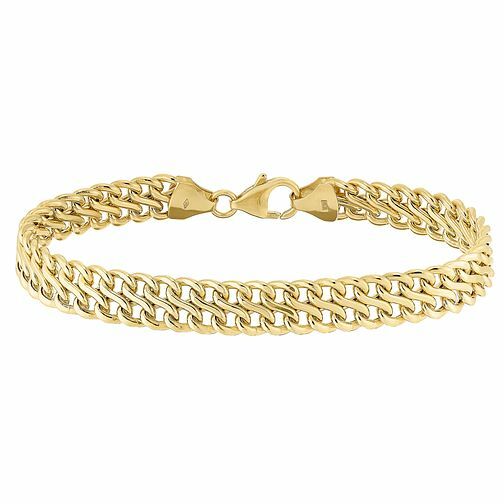 9ct yellow gold two row link bracelet is rated 5.0 out of 5 by 3. Rated 5 out of 5 by Anonymous from A special item of jewellery This is a special piece bought for a special occasion. It is delicate, attractive and high quality. Rated 5 out of 5 by Anonymous from Sturdy and stylish bracelet 'Sturdy' is important to me because I like a gold bracelet that I can leave on all the time. Previous gold bracelets with hollow links have ended up getting twisted, dented and developed rough edges. This one seems more solid than most. Worth paying extra for but I was delighted to get in in the sale.